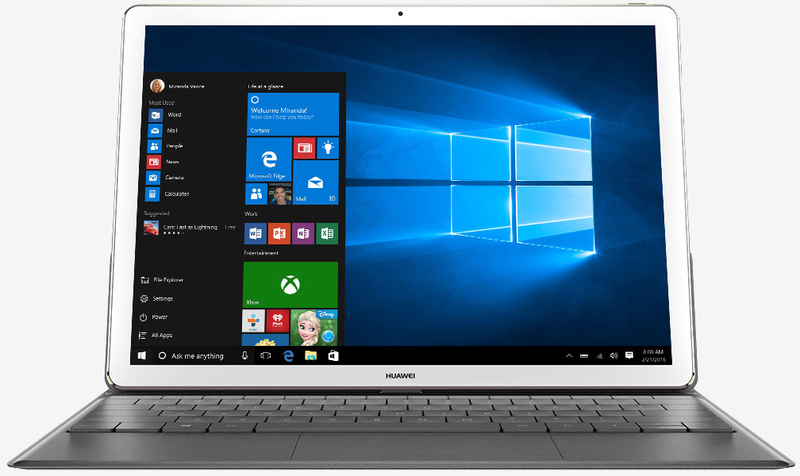 Huawei at Mobile World Congress pulled back the sheet on its first-ever 2-in-1 running Windows 10. The Huawei MateBook is an incredibly thin 2-in-1 that aims to take on devices like the Surface and the iPad Pro in the productivity category. The MateBook features a 12-inch IPS LCD display operating at a resolution of 2,560 x 1,400 that's powered by an Intel Core M processor of your choosing. It measures just 6.9mm thick – rivaling the thinness of today's flagship smartphones – and tips the scales at only 640 grams. The keyboard folio is backlit with 1.5mm of key travel. Rather than Bluetooth, the keyboard interfaces with the tablet via a proprietary connector on the side of the tablet. Speaking of, that's where you'll also find the device's fingerprint reader, tucked neatly between the volume rocker buttons. Ars Technica found the trackpad to be surprisingly large and responsive while the two angles of tilt (54 and 67 degrees) were described as sensible choices. There's also the optional MatePen, a stylus that offers 2,048 levels of pressure sensitivity with an elastomer tip should you have the need for it. Its all-metal unibody design certainly looks the part of a premium device with smooth, rounded edges and chamfered buttons. Huawei says its 33.7Wh battery is good for around 10 hours of standard use. The Huawei MateBook starts at $699 which includes an Intel Core M3 processor, 4GB of RAM and 128GB of local storage. On the upper end, you can expect to pay $1,599 for a Core M7 processor, 8GB of RAM and 512GB of storage. Note that accessories like the keyboard folio and stylus are extra ($129 and $59, respectively). Look for it to go on sale in the US "in the coming months."